Smart mapping is an exciting capability that can help you create beautiful and informative maps quickly. It's never been easier to craft visually stunning maps that tell the stories you want to tell. This guide will familiarize you with smart mapping and its overall workflow so that you can start to make your own mapping masterpieces! Read the article. View the How to Smart Map story map. You can quickly make beautiful, colorful maps like the one above. Without doing any programming, you can create and deploy custom mapping apps for the web that can run on any device. How? By using Web AppBuilder for ArcGIS. Walk through each step of how to download, install, and configure Web AppBuilder for ArcGIS Developer Edition to work with your ArcGIS Online organization. Read the tip. What's new in ArcGIS 10.5? ArcGIS Enterprise with its full mapping and analytics platform, the Insights for ArcGIS app, powerful analytics capabilities, and much more. Read the blog. Learn more. Seeing your ArcGIS Online user profile is how your colleagues and peers measure the value and veracity of your shared items such as maps and apps. Esri's Bern Szukalski shows you how to compose and format a great profile. Read the article. Thirteen students won a total of $51,000 and other prizes in the Esri-sponsored Global Content Challenge. The students used Living Atlas of the World content and the Esri Story Map Journal app to create their winning science projects. Read the article. Derek Rieckmann from Midco talks about how his company uses the ArcGIS platform to track its fiber-optic and coaxial cable data, create maps of service areas, and more. Watch the video. In the most recent ArcGIS Online release, new capabilities have been added to improve analysis, provide a better user experience, and make it easier to manage accounts. Read the blog. This one-hour technical workshop, presented by Esri Professional Services director Brian Cross, walks you through the five essential steps for getting a successful Web GIS up and running. Attend the workshop via this video. What's New in Story Maps? With the ArcGIS Online update come several improvements in Esri Story Maps apps. For example, you can now add images from your computer directly into the main stage or side panel of the Esri Story Map Journal or Esri Story Map Series apps. Read the blog. One way to build an Esri Story Map Tour app is to use a spreadsheet (CSV file) with the locations of the photos you want to use, the title and description of each tour stop, and other information. Read the blog. View the Treasures of Redlands, California, Story Map Tour app. 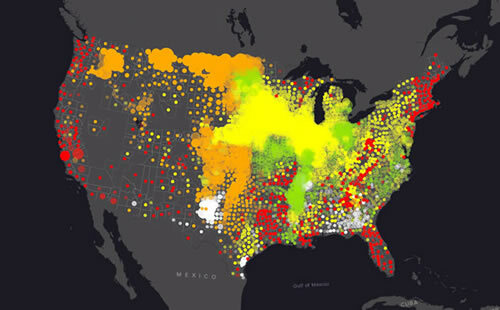 Esri's Jeff Shaner and Craig Gillgrass show you how to use Workforce for ArcGIS to plan and assign fieldwork, update the status of assignments, and much more. View the technical workshop online. Seventeen communities have contributed new map layers to Esri's online basemaps through the Community Maps Program. The additions include Corona, California, and Blue Springs, Missouri. See the contributions. Read the blog. In this new Learn ArcGIS lesson, build skills in administering an ArcGIS organization, designing a home page, sharing content, creating groups, and more. Take the ArcGIS Online lesson. Learn how to select the right transition effect between views in the Esri Story Map Cascade app. The choices include fade, fade slow, swipe vertical, swipe horizontal, and none. Read the article. Using crowdsourced data from Wikipedia, the Esri Story Maps team worked with PeaceTech Lab to map the location of worldwide terrorist attacks. View the story map. Data Appliance 6.3 for ArcGIS is now available. It plugs into your internal, secure network to deliver preloaded imagery, basemaps, and reference layers. Order today. The ArcGIS Online US School Competition 2017 challenges students in grades 4–12 to analyze, interpret, and present data about their states by using ArcGIS Online presentations, web apps, or story maps. Learn how your school can compete. Read the blog. Esri has pledged to support a European Commission initiative to boost digital skills in Europe. The company will offer free access to the ArcGIS Online platform to 300 primary, secondary, and vocational schools in 10 European Union nations by the end of 2017. Read the blog.